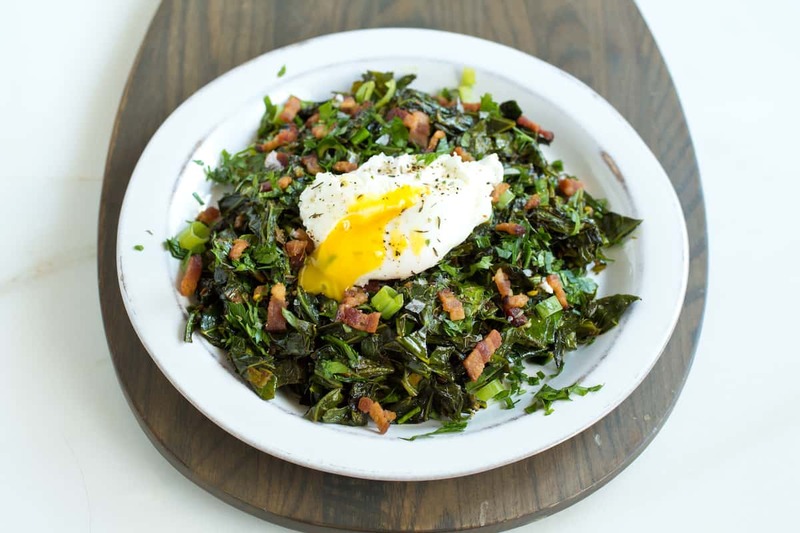 Spiced Collard Greens with Bacon and Eggs | Good. Food. Stories. 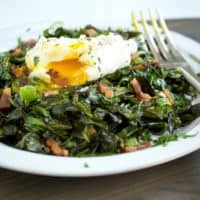 Greens have always been a favorite vegetable of mine, but once I moved to New Orleans, collard greens quickly took pride of place in my veggie rotation. And I couldn’t be happier they have. Collards have a long history in Southern regional cuisine, and especially in soul food. Like so many Southern culinary traditions, the now-familiar preparation of collards slow-cooked with a bit of meat (usually ham hock or fatback) can be traced to cooking methods practiced by enslaved African Americans. With access to only minimal and inferior cuts of meat to feed large numbers, these bits of meat were used to flavor large pots of greens or stews—dishes made mostly of vegetables that enslaved folks could grow themselves, and which didn’t need constant attention while cooking. Collards, which are in the cabbage family, have thick, sturdy leaves that hold up well in slow cooking, and a slight bitterness that mellows with the addition of other flavors. The result of this traditional preparation is a stewed green, rich and smoky from the meat, and dripping with pot likker (the water in the pot that’s been flavored by greens, meat, and spices). It’s perfect to soak up with the cornbread with which collards are often served in New Orleans. As the regional food movement has been on the rise, though, ingredients like collards have become more and more visible beyond the familiar traditional dishes and outside of the South. But while variations on soul food were a short-lived trend on the Food Network and in restaurants in New York and Los Angeles over the last five years, in the south, there’s no desire to replace traditional dishes. Many cooks are looking simply to reinvent them as a way of demonstrating how very relevant they still are, and to showcase the versatility of regional ingredients. And it’s no stretch to show collards’ relevance or their versatility. The same sturdiness that makes them great for long, slow braising also makes them a wonderful, hearty dish on their own, or the perfect assertive accompaniment to other veggies, beans, and meats. My favorite way to cook collards takes its cues from the familiar Southern preparation, but uses a Middle Eastern flavor profile to balance the bitter notes and garlic for a full, earthy taste. f I’m feeling patient, I’ll start with a piece of bacon in the pot and cook the greens in bacon fat rather than olive oil, and then crumble the bacon over the top to serve. This is a dish that could be bulked up as a dinner entrée, served as a side, eaten cold leftover for lunch, or would make a satisfying weekend breakfast. Best of all, consider this preparation a gateway recipe for the wider world of greens—once you’ve tried it with collards, you can start adding mustard greens, beet greens, dandelion greens, and the tops of carrots, turnips, and radishes to the mix! Collard greens are a mainstay of Southern soul food. 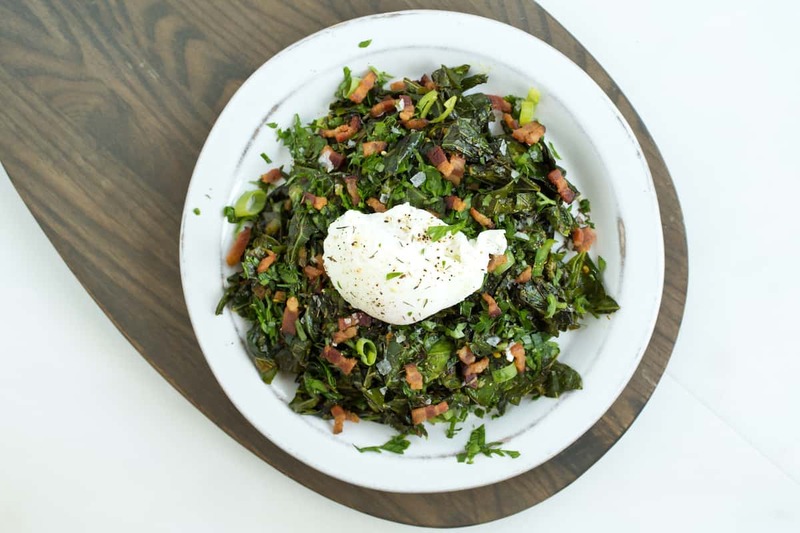 This modern preparation of spiced collard greens pairs the sturdy vegetable with bacon and eggs. Cook the bacon in a large high-sided skillet or saucepan over medium heat, stirring occasionally until the fat is rendered and the bacon is crisp. Remove the bacon with a spider or slotted spoon and transfer to a paper towel-lined plate. Leave the bacon fat in the pan. Reduce the heat to medium low and add add the garlic, half the scallions, and the cinnamon, turmeric, chili flakes, and cumin. Cook for just a minute until the garlic is softened, taking care not to let it brown, which will turn it bitter. 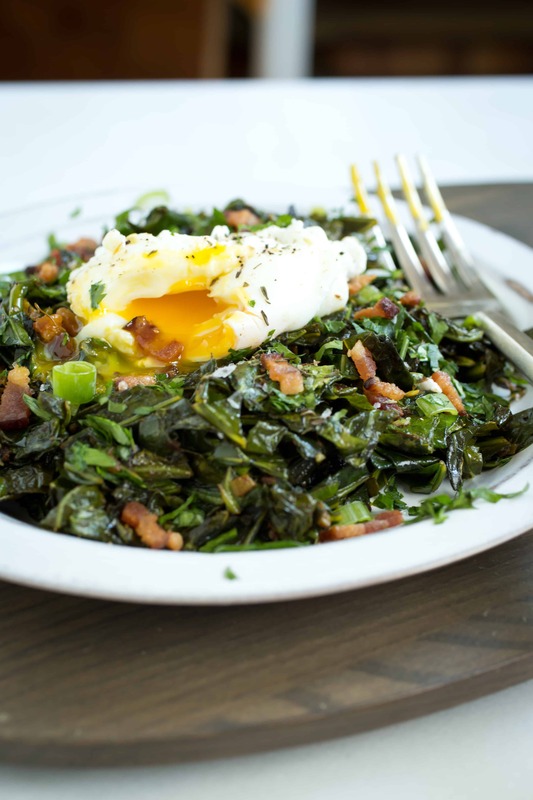 Add the collard greens to the pan and toss to coat. Increase the heat to medium and cook for about 10 minutes until the collards are tender, stirring frequently to make sure the greens are cooking evenly. They'll wilt, but will retain their structure in the pot. When the collards are tender, add the remaining scallions and half the za'atar, and cook for another minute to combine the flavors. Pile the greens in a bowl and sprinkle with the remaining za'atar and fresh parsley. Crumble the reserved bacon over the greens, and top with the cooked eggs. Finish with a sprinkle of salt, a grind of pepper, and a note on your grocery list to buy more collards, stat!